Managing and presenting your sales process clearly can be complicated and make clutter on a slide if you’ll use mostly a text. Here we show a few ideas on how you can present this process with creative sales funnel diagrams. To ensure the whole the team works consistently on your marketing and sales goals, it is important to explain well all stages of the marketing and customer journey process. You should be laconic and creative enough. The sales funnel is a simple way to visualize all steps which your customers make – from realizing they have a need for your product to the final purchase making. The pipeline is the key to measuring, managing and forecasting your sales quotas. 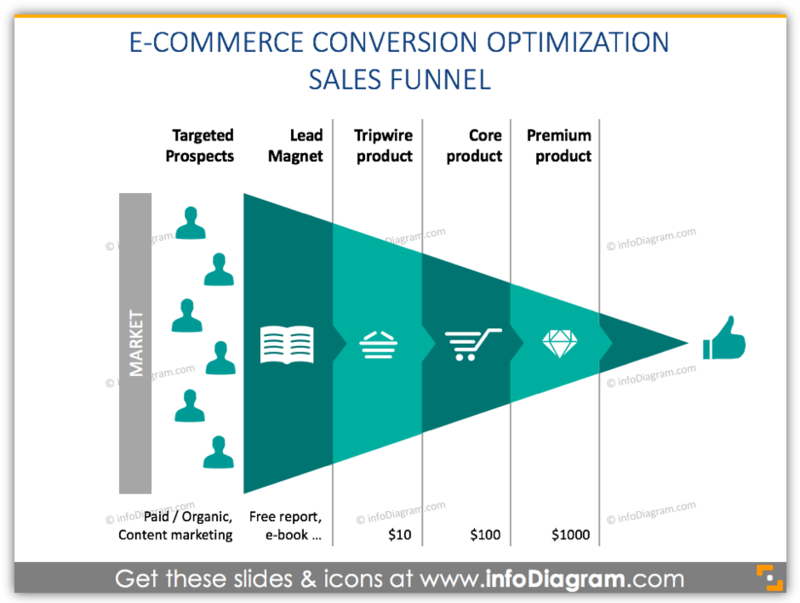 Thanks to the funnel you can easily illustrate the conversion from a lead to the client. Remark: You can get all presented slide templates from Sales Funnel PowerPoint collection. Sales funnel diagram was created for separating customers into groups and finding a specific manner to work with each of them. Thanks to this layout your team will see the complex sale process that can help to avoid time-wasting or extra work. Adding visual sales pipeline diagrams to your presentation will help you put the point across the topic while making it look professional. In this blog, we present the following Sales Funnel types we experienced frequently in various presentations: from Business to Business (B2B) sales funnel – representation of the customer journey, creative scribbled marketing funnel visualization idea, to lead nurturing in e-commerce conversion optimization funnel. Of course, your choice of picking the particular pipeline depends on your company’s sales model. Below we present a few variations of the funnel that can be adapted for your business specifics. 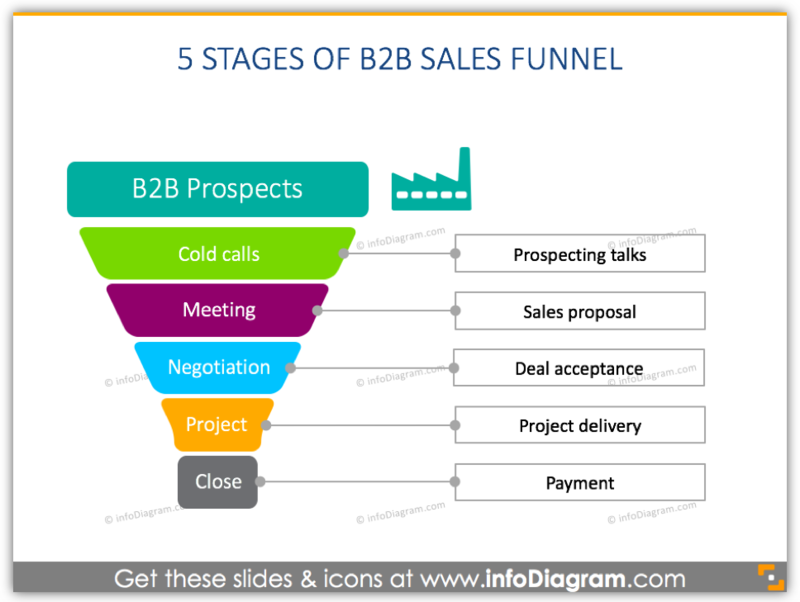 Above you can see the example of the B2B sales funnel illustrated in 5 basic stages. This diagram can be useful to formalize a B2B sales process and complete your sales activity. Adding this modern flat design vertical layout to the presentation will help to list the channels you work with or should focus on. Here we presented the similar example of three levels sales funnel diagram. Adding a simplified sales pipeline can help to make slide not too crowded with excess content. Thanks to hand drawn arrows and scribble icons the presentation slide will focus the reader’s attention to the flow and stages. Plus it will make your slide more personal and originally-looking. 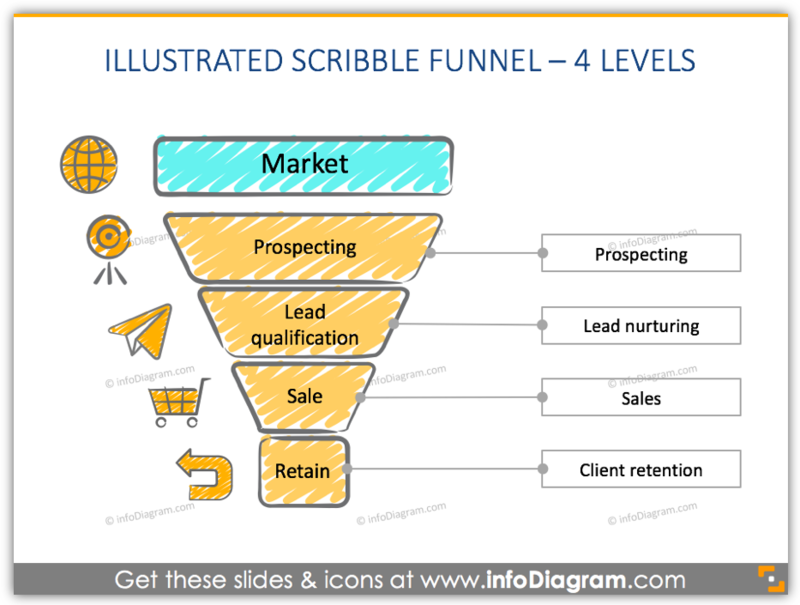 We also created four levels of vertical sales funnel diagram with scribble filling. This hand-drawn style layout helps to explain each stage of the sales process: prospecting, lead nurturing, sales and client retention in an informal way. Thanks to visual accentuated sales steps your presentation will stand out from other formal slides. That can be especially handy at conferences if you want to differ from others. premium product – the most expensive product for your best fan customers who can afford. The pricing starts at $1000 and is not for every pocket. This simple flat source infographics will help you to create a specific sales process slide. Using it you can visualize target prospects and show financial data associated with at each sales stage. 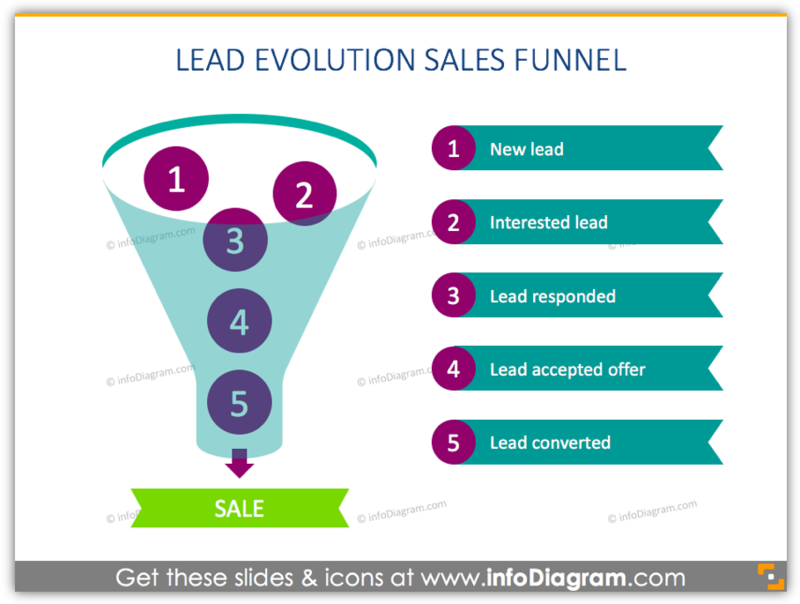 Above you can find another graphics of vertical lead evolution sales funnel. This drawing uses a metaphor of falling balls into the funnel. The presented schema will help you to show the transformation from new lead to purchasing product. This layout intended to make your presentation more visually, avoid extra text and sterility on a slide. Get inspired and consider using one of those examples of sales pipeline diagrams: vertical B2B sales funnels, hand-drawn scribble pipelines, vertical e-commerce conversion optimization or falling balls lead evolution sales funnel. To help you impress audience we designed PowerPoint template you can reuse to manage the sales process. 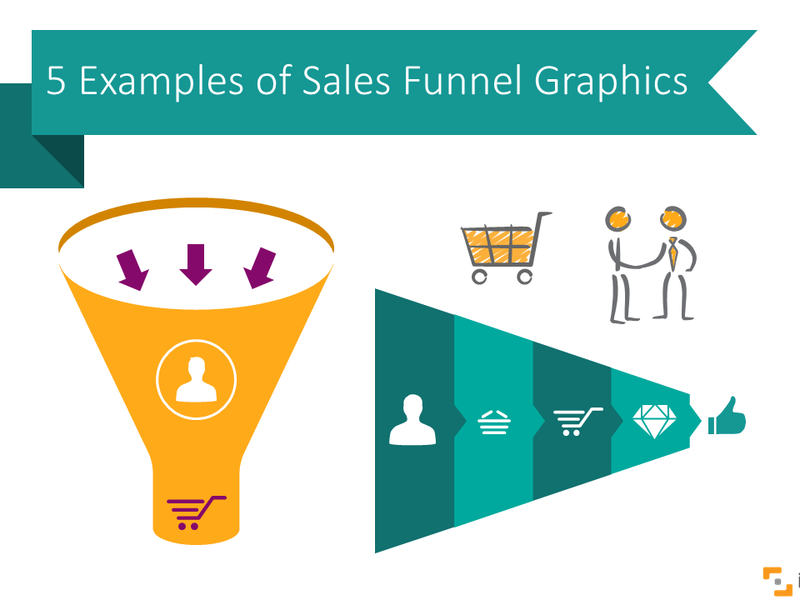 Why Use Pre-designed Diagrams for Sales Funnel? 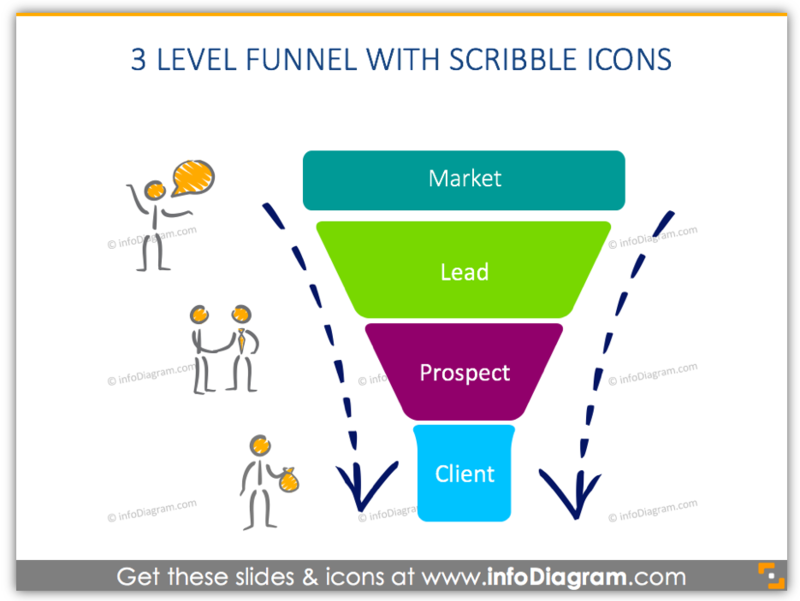 The infoDiagram Sales Funnels PPT collection will help you to transform difficult for understanding presentation to creative and effective one. The diagram helps to illustrate leads progress linearly from the top to the bottom of the funnel. Thanks to vivid graphics you can easily show your team the sales process and complete all steps to the best of your ability. You can easily copy the particular layout and use it straight away in your presentation. The deck consists of predesigned infographics shapes for showing various sales processes on a slide. Sales funnel collection is suitable especially for marketing and business development presentations. We also prepared the set of flat icons for infographics: businessman, man, factory, book, diamond, thumbs up, market, shopping. The diagram is also included set of scribble symbols. All shapes intended to show sales process and sales participants: globe, target, development, man, shopping, retain, user, meeting, the buyer. If you want to get more infographics slides, check this PPT diagrams graphics Bundle with over 200 slides.